Getting back into the swing of things. Camden proved to be a great day out for our home grown team. Again our team of four boys picked up 2 x firsts and 2 x seconds with Gunnamatta Colorado managing Best Med/Drk Fawn and Champion Junior Male. Finally made a decision regarding our annual open day. This year we're cutting back to just one day - Sunday 19th May (10am - 4pm). Love to see you if you're able to visit. Oops, looks like the blog has been taking a bit of a back seat. Sorry, dear reader. Finally dusted off the white coat (amazing how much they shrink!) and wandered down to Moss Vale for our first outing. Happy with the results: our home grown team of 4 picked up 2 x firsts, 2 x seconds, and Gunnamatta Colorado was later awarded Best Med/Drk Fawn. Trying to sort out critters for Camden, then is off to Homebush for the Easter Bunnies. No need to adjust your sets, yup, that was us on My Kitchen Rules. Really quite a fun night in the grounds of St Mary's Cathedral in Sydney. Given that we "farmers" were invited to acknowledge the hardships of the drought it was fitting that the heavens opened just as we were walking to our seats under the marquee - got drenched. Very interesting to see how the thing is put together - huge numbers of people and cameras catching every moment. Sadly, we had to sign a confidentiality agreement, so couldn't let anyone know. Now, if we can get seats at Dancing With The Stars, sue will be a very happy chappie. As usual, a huge few days being involved with the Hawkesbury Colour Show. Traditionally we try to bolster the numbers and this year was no exception, with the Gunnamatta team comprising a total of nine critters. Everyone picked-up a ribbon and this time Cyprienne was awarded Champion M/D Female. Just enough time to dust ourselves off following all the fun at the RES, and it's back on again. Took an extended group out to the Royal Bathurst Show and were very pleased with the results. Everyone took out a ribbon and Gunnamatta ended up with 2 x 2nd, 6 x 1st, Champion Junior Male (Gunnamatta Sonic) and Champion Senior Female (Gunnamatta Chantelle). Easter was again dominated by the Royal Easter Show at Homebush. Our limited team managed to come away with three firsts and one Highly Commended and, given the competition from as far away as Western Australia, we were pretty happy with those results. When not parading critters, yours truly was hanging off the end of a microphone at the shearing competition. This again was a great crowd pleaser and I estimate each of the four daily competitions attracted somewhere between two hundred and three hundred people. The show season for us kicked-off on Sunday with a visit down to Moss Vale. Our two critters did us proud, with Gunnamatta Spartan getting a 1st in the Intermediate Grey Male section, and Gunnamatta Cyprienne getting a 1st in the Intermediate M/DF Female class and then Reserve Champion Intermediate Female. We were also able to bask in the reflected glory by exhibiting the two critters from Warralinga who both managed 1sts and one then went on to receive Champion Junior Female. Our thoughts are with Lyn & Graeme at this time. Really happy with the turn out at our open days this weekend. Lots of interested folk including some who have taken our advice to attend next weekend's "Getting Started With Alpacas" workshop. Despite the weather and the fact that it was the Mothers Day weekend, we were kept busy from start to finish. The highlight occurred on Sunday when our grey girl Lily decided enough was enough and went into labour. With an audience of a dozen or so she had a perfect delivery and added yet another boy to this year's tally. We shouldn't complain as one of her earlier cria turned out to be awarded "Best Grey" at the National Show. Hopefully the solid blue-black fella can follow in his big sister's footsteps. A late shearing and lousy weather made for a pretty slow start to the show season. For the first time in a couple of decades the Gunnamatta Mob failed to make an appearance at the Easter Show. Our first venture for 2017 was the Royal Bathurst Show where we picked up a Reserve Champion with our medium/dark fawn girl Kayla. The following weekend was the Hawkesbury Show. For the first time the region decided to change to a "colour" show, and the results were excellent. The field included approximately 130 critters, with a goodly smattering of suris. The Gunnamatta Show Team had an excellent day out, picking up 4 Reserves, 1 Champion and culminating in Supreme Med/Dark Fawn. Now on to the Goulburn Carousel of Colour. Have to confess that at 3am on a cool morning the wisdom of heading off to Goulburn was somewhat questioned. The day went pretty well, with the team of 3 each picking up second places in their respective classes. Given that a number of "heavy hitters" from inter- and intra-state were in attendance, the team did us proud. The highlight was Kayla in the Intermediate Female Med/Drk Fawn class. In what was described by the judge as an elite class, our girl was awarded Reserve Champion M/D Fawn Female Huacaya. A big thank you to all who took the time to attend our open weekend. Numbers were pretty good over the two days, despite the Sunday being Mother's Day. A a result of the weekend, a number of our critters will soon be delivered to their new owners. To say it's been an interesting couple of weeks would be something of an understatement. Guess who managed to pick up the CryptOLOcker virus? The short story is that our computer was stuffed and many of the files lost due to encrypton. Don Culey to the rescue - a number of hours and quite a few dollars later, we're back in business. Now all we've got to do is learn how to use Windows 10. On the show scene it's also been quite interesting. We had a fairly dismay day of it at Bathurst, but the team came good a week later at Hawkesbury where Kayla again took out Champion Junior Female and Chantelle was awarded Champion Intermediate Female. Our new boy Amechi managed a first, as did Cinderella. Andalusia and the young Rafferty both managed thirds against strong opposition and Cartouche ran second in the Junior Male White class. The show was well supported and the weather gods were kind. It was great to see a number of new faces helping out with the set-up and break-down. Next on the agenda we have a display day out near Kellyville and then our Alpaca Week open days on the 7th & 8th May. The show season for 2016 has kicked-off and Gunnamatta is off and running. We had a very rewarding time at Camden with our M/D Fawn girl Kayla taking out Champion Junior Female and Best M/F Fawn and getting rather close to Supreme. We don't usually show Whites, but Chantelle managed to get Reserve Champion Intermediate Female. The run was finished off with Coco being awarded Champion Senior Female. Congratulations to their father, a rather chuffed Gunnamatta Catalyst! The dust has now settled after a rather hectic time at the Sydney Royal. Again, the team did us proud with Kayla getting a first in her class and Cinderella getting a first in the Adult Female (Grey) category. The success was rounded off when our new boy, Softfoot Rafferty, picked up a first in the Junior Male (Grey) class. Next weekend sees us off to Royal Bathurst and then, the following weekend, Hawkesbury. It's nice once the dust settles! Managed to keep half the critters dry for shearing, then off to The Ledger. With yours truly on MC duties I didn't get much of a chance to tidy-up our girl. Of course, she was first into the ring and really took to heart the notion of "clean paddock condition". Never the less, the judges saw through the wet vegetable matter and awarded her a 2nd in a very large class. Our new boy Amechi (jointly owned with Warralinga & Alpacandes was also placed 2nd in a class of five on the Sunday. Given that a number of the major players brought large teams to this provincial show, we were pretty happy with the results. After a quick trip to the farm if was round to Warralinga to assist with their shearing, then back to Galston to finish off our own mob. A big thank you to Lorraine & Roger from Lifestyle who backed-up for this second session. Hopefully some down time now until our November shearing out at Running Stream. Gotta confess - we don't usually get too excited about 5th places but to get one at the Nationals, in a class of 14 Junior White females, was quite a thrill. With Coco following up with a 2nd in a large class of Adult Brown females made the whole show quite a success for little old us. Next on the horizon is shearing at Galston this coming Friday, then off to The Ledger on Saturday & Sunday. For once your humble scribe made the right choice and departed from the farm a day early. The following day both roads out of Lithgow were closed. The picture above shows our neighbor Patrick checking on our snow bunnies. A huge big thank you to the Newson mob for looking after our critters while we were off galavanting. The Kempsey Show was a great success and this time we not only avoided dead cows on the freeway but also returned with all wheels on the float. Our team did pretty well, with 3 firsts, 3 seconds and 2 Champions. Caught up with Joy & Parkie (shown below) and later that evening demolished a fair quantity of amber liquid. Took the plunge and entered our first ever "Colour" show this weekend. For logistical reasons we could only attend the first day, but the long trip was well worthwhile. We took three greys and a brown female and managed to get ribbons with all four. The standout was in the grey class where our junior girl Anadalusia, having beaten her sibling into 2nd place, went on to be awarded Champion Grey Female. The one good things about foul conditions is that you know that anyone who does turn up is interested in alpacas, and this was the case for us. Only a few visitors, but some very good questions, genuine interest and even new homes for a couple of critters. Hopefully we'll have a couple of starters for the Seminar/Workshop on July 13th. Royal Bathurst has been and gone, with another good performance by our squad. Gunnamatta Coco continues to impress with another Champion Adult Female - not too shabby for a brown. Sadly, despite huge efforts from the usual suspects, the Hawkesbury Show was cancelled. The grounds were saturated and although the weather remained clear over the weekend, the damage was done. A group of us pitched our tents on both the Saturday & Sunday and made the best of things, talking to a number of interested visitors about our industry and our critters. Now all we have to do is hope the rain holds off for our Open Days this weekend. Just about recovered from the Easter Show. Against all the heavies from WA, SA & VIC we managed to jag a 2nd and a 3rd - gotta be happy with that. A few days off and then it all starts again with Royal Bathurst followed by the Hawkesbury Show. Before you know it we'll be opening our doors for Alpaca Week (2nd & 3rd May). Then it's a case of dusting off my notes for my talk during the Getting Started With Alpacas workshop in June. Seriously chuffed to open the current issue of the AAA magazine to find that Gunnamatta Iceman has been doing his thing down in Tassie. The boy managed to take out Supreme at the Royal Hobart Show! Congratulations Lauren at Maravillar Alpacas. Hope you all had a bonza Christmas and NYE. Have to confess we "ran away" for the festive season. As far as the Taxation Office is concerned, we were visiting New Zealand to check on how Voldimort and Violet were settling in with Anne and Bevan just north of Christchurch. In an attempt to fill in the remaining days we hopped onto a bus and took in the wonders of the South Island. Our trip took in a helicopter ride around Fox Glacier, Dunedin, Milford Sound, Mt Cook and a very rapid descent of the Shotover River. OK, so the bus in question was a bloody big $800,000 Scania fitted out to accommodate just 20 souls in incredible comfort. Nights were spent under the stars - at least four and a half of them! Tough, but somebody had to do it. Back now and ready for another fun filled year. Look forward to catching up with you at the shows or our annual open day in May. It's fair to say that the Charles Ledger has become one of the major regional shows, attracting as it does many of the "big hitters" from both intra and inter state. We were therefore delighted with our results. Our team of 5 were each awarded blue ribbons, with Kohinoor going on to become Champion Intermediate Female. As the "best of colour" classes came and went, we failed to add to our tally - that is until the final offering, the inaugural David Izard Perpetual Trophy. Named in memory of a stalwart of our industry, this trophy was awarded to the Champion Grey/Roan. Yup, you guessed it, our boy Florimond was adjudged Champion Grey/Roan for the 2014 Charles Ledger Show. Got to confess we were that excited we almost missed hearing that we'd also won one of the many prizes in the raffle! A truly great outing for the Gunnamatta Mob. After our dramas at Kempsey, quite an uneventful trip out to Mudgee for the Central West Show. Weather was seasonally "crisp" with light snow falling on the Friday night. The show itself went well - although with nearly 200 entries it looked like finishing under floodlights. The Gunnamatta team of 6 acquitted themselves pretty well. Each one managed a first in its class and we ended up with a Reserve Champion Senior Female (Gunnamatta Autumn Mist) and Best Brown (Gunnamatta Coco). What seemed like a good idea at the time turned out to be a 5 hour excursion, commencing at a time that say totally foreign to Sue. The trips up and back were far from eventful. On the way up we happened upon a dead cow in the middle of the motorway. Fortunately we were warned by a brave bobby who stood in the line of traffic, in pitch darkness, waving his wand. The way back was perfect - up until the time we arrived at Galston only to find that one of the wheels of the float had decided to go its own way! The show proved successful for the Gunnamatta mob with 5 firsts, one champion and three reserves. The new grey girl, Gunnamatta Jubilation, got an "honourable mention" during parade of the Champion & Reserve Champion Junior females. During the award of Supreme we again had a moment when our brown girl, Gunnamatta Coco, was brought out to be compared with the eventual winner. All in all a great show. The evening was spent at the home of good chums, Alan & Joy. Amazing how a few pints of home brew can make you forget that you've been up since 2.30am! Following last year's weather we approached the Hawkesbuy Show with some trepidation. We needn't have worried - the weather was as close to perfect as you can get. We increased our show team by one and, with a lot of help from young Miss Farthingwood, had a ripper of a show. With yours truly on microphone duty it was upto Sue to handle the critters, and what a job she did! With a team of 5 we managed 5 firsts, 2 Reserve Champions, 2 Champions, 2 Best Colours and a first in Sire's Progeny for Gunnamatta Catalyst. To top things off a reluctant Sue was coerced into taking part in the Grand Parade and walked off with the ribbon for Best Alpaca Exhibit. Would love to take time to relax, but now we've got to get ready for our open weekend on 17th & 18th May - hope to see you there. If the gauge is down to freezing it must be time again for the Royal at Bathurst. With Sue on babywatch the team set off at sparrow's to take on the ice, snow and wind. The day went off without a hitch and between them our four amigos picked up four firsts and three Reserve Champions. Some lovely comments from the judge and a chance to catch up with some chums - all in all a good day out. Really chuffed with our results at the Sydney RES. We managed to pick up two firsts and two seconds. Given the competition our four member show team waved the flag for the small breeders. Whilst not on showing duties we were heavily involved in the shearing demonstrations - a really good crowd pleaser. Braved the elements and took the team to Camden Show. The weather remained fine - right up to the moment we were half way back to the van at the completion of the day. Absolutely amazed we didn't get bogged - more luck than good judgement. The critters did well with Gunnamatta Coco getting a first and then Best Brown. Sadly her brother decided that it was cold enough to retract his bits. The judge commented that he had the best fleece in the class but...........After serious discussion we decided to give Autumn Mist a day out. Turned out to be a good choice as she won her class and them got Champion Senior Female. Now we start getting ready for the Easter Show and then Hawkesbury. Attended the funeral service for longtime Hawkesbury-Blue Mountains region member Jeanne Brown of Alleena Alpacas. The service was fantastic and the venue crowded with family and friends including a large number of her alpaca chums. Really love the rain, but does it have to bucket down the night before a show when half the team is still out in the paddock? The short story is that our complement at the Moss Vale Show was reduced by 50% courtesy of Huey. Very happy for our two Gunnamatta Catalyst critter to pick up first in their respective classes. Hopefully later shows may have a "colours" component as the young boy in particular is giving signs of following in his father's footsteps - time will tell. None of us "put in the hours" for the glory, but it's kind of nice to know someone out there cares. At the HBM Christmas party Sue was presented with a Certificate of Appreciation by Graeme Dickson on behalf of the AAA. Quite a busy time of late. Early May saw the start of National Alpaca Week. The weekend was quite a success and a number of interested parties took advantage of the fine weather. Alan Park was a great help on the Saturday, and the Bonitan mob were of similar assistance over the weekend. Spent a day out at the racecourse in Mudgee during an event organised by the local group, Alpacas Over The Ranges. Numbers were down, but a good time had by all. The annual Getting Started With Alpacas workshop was a great success. We eventually ended up with 19 starters - a very enthusiastic group. Hopefully the team managed to answer all the questions and that the industry can, as a result, end up with some "new blood". Thank heavens for weather forecasts! With the threat of impending heavy rain the "set up" team decided it would be prudent to establish an emergency show ring under the cover of one of the two marquees used to pen the animals. Good move. The rains started way before "sparrows" and, in effect, lasted until close of play. Despite the lousy weather all those exhibitors that made the effort seemed to enjoy themselves - as did Victorian judge Jillian Holmes. Despite a dreary start, not even the sun gets up at 5am, the day at Bathurst turned out to be a cracker. The team behaved themselves impeccably with the older girls bringing home the bacon. Cinnamon again just missed out on getting the first in her class - a real pity as the girl that beat her picked up Reserve Champion. Found out the hard way that even a soft foot, correctly aimed, can bring tears to your eyes ......... fortunately there were a number of volunteers offering to help "rub it better". Given the competition we were happy with our results at this year's RES. The absence of the Fashion Parade was disappointing but I managed to spend a wee bit of time on the microphone. The crowds were huge and there seemed to be a fair amount of genuine interest in alpacas. Hopefully some folk will attend our open days during National Alpaca Week and the really keen ones will sign up for the Getting Started with Alpacas workshope scheduled for the 25th May. After a fairly slow start 2013 really kicked-in towards the Easter period. Sue again convened the Castle Hill Show, this time with Kate Munyard acting as the understudy. Good experience as she will be looking after the Hawkesbury Show at the latter part of April. Sadly Robyn Fullerton has decided that this will be her last as far as the fashion parade is concerned. I've had a ball MCing the event for the past few years - a tough gig, but someone's got to do it! A great start to the show season for 2012 - it's always nice when greys walk away with broad ribbons. My final attempt at convening the National Auction went off pretty well. Had a bit of fun when Paul Cramley agreed to dress up as Ozzie Osbourne when parading Lot 1 "Black Sabbath". Highlight of the show event was getting awarded Best Grey for Gunnamatta Laelia - still can't wipe the grins off our faces. Sadly the dressing-up part of the Ledger seems to be a thing of the past - we used to enjoy strutting around like Lord & Lady Muck in all our finery. Sadly the show contained no "Best Colour" segment - methinks Catalyst and Laelia might have been in with a good chance. Hawkesbury again proved to be a happy hunting ground for the Gunnamatta team with two Championships and very nearly a Reserve for our grey girl. During the parade of the champion and reserve the judge awarded an unofficial "highly commended" to Laelia. Bathurst provided a "crisp" farewell to the balmy days, but the results were worthwhile. Laelia and April Dawn received favourable comments from judge Helen Fritsch and were awarded a first and second respectively. Due to a late shearing, the Gunnamatta Show team has been on an extended holiday but we finally dusted off the white coats and headed back into the ring for the Sydney Royal. Delighted to pick up two 2nds with our team of two and particularly chuffed with the judges comments for both April Dawn and Laelia. Next stop Bathurst and then Hawkesbury in mid May. Hopefully by then the voice will have recovered from MCing a dozen Fashion Parades! Can't think of a better way to finish the autumn show season than with our results at the Hawkesbury Ag Show. The team really did us proud as the judge obviously liked what she saw. Sadly Sue was unable to enjoy the moment as she was at home looking after a rather sick girl. We were particularly chuffed with the results for Catalyst, our Medium/Dark Fawn son of Ambersun Gallipoli. At Camden judge Julie Bird agonised for an eternity before giving the nod to the White entry - subsequently her Supreme Champion! With the cancellation of a few of the regular events, the 2009 show season was relatively quiet for the Gunnamatta Mob. In the last show of the year for us things took a pleasant turn when the two alpacas we took to the Charles Ledger both were awarded broad ribbons: Gunnamatta Valentina took out Reserve Champion Senior Female and Gunnamatta Catalyst, our promising Ambersun Gallipoli boy, took out Champion Intermediate male. 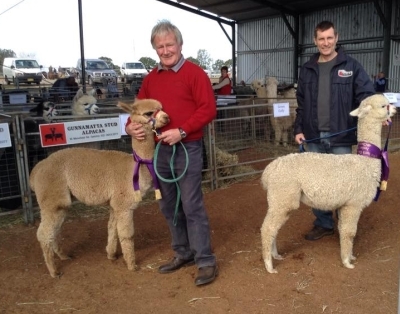 May proved to be quite a hectic month with the holding of both the Hawkesbury Ag Show and National Alpaca Week. The Gunnamatta Mob teamed up with a couple of like-minded souls and ran a pretty concerted advertising campaign to attract new and potential breeders to our open days. On the whole the promotion went pretty well and we estimate that we had just under 100 visitors over the weekend. The Spring Show schedule has resulted in some more pleasing results. Delighted to announce the arrival of Marconi's first cria. We've just enjoyed a fun filled day at the ABC in Ultimo, filming a segment for the New Inventors programme to be aired on 14th May, 2008. A shearer in Tasmania has developed a animal restraint to assist when shearing and, at the last minute, the producers of the show thought it might be a good idea to have a live alpaca in the studio. Despite an extremely long day in unfamiliar surroundings Gunnamatta Iceman behaved himself and hopefully won the hearts of the audience. Alas the device did not win on the day, but hopefully the exposure may generate some interest in our industry. In a fit of enthusiasm we went a wee bit overboard with our entries for the Hawkesbury Ag Show (Natasha Clark). Having just completed two "Royal" shows with entry fees of about $50 per animal, the cost of entry to Hawkesbury seemed a real bargain so we went a tad over the top with a team of eleven! Following the cancellation of the last shows for 2007 we were keen to get back into the ring this year and decided to try our luck at both the Canberra and Sydney Royal Shows. It seems we were not the only ones - both shows had double the usual number of entries. To each we took a team of eight, but for reasons of logistics had to change some of the individuals. Really disappointed to find that the remainder of the Spring Season has fallen foul of the equine flu. Hopefully the National will not be effected - we'll just have to wait and see. By way of compensation we were very chuffed to find Gunnamatta Marconi adorning the cover of the September 2007 issue of Small Farms magazine. Guess like many other Baby Boomers we were hoping for the cover of The Rolling Stone, but this will have to suffice! A glorious Spring day was enjoyed at the CC/H Show at Wyong Racecourse. Numbers were down, but a quality field was presented to judge Darrell Bishop. The Gunnamatta Team did its stuff and managed 1x Champion, 2 x Reserve Champions, 4 x Firsts and 1 x Third. 2nd Intermediate Male - Grey/Roan (Strathclyde Campbell [MG]) Shown on behalf of one of our agistees. We were particularly happy with Valentina's broad ribbon, to go along with her Reserve Champion Junior Female at Castle Hill 2007. Our Champion winning boy, Gunnamatta Sheldon, has recently been sold and is currently at stud in Victoria. Also in "Mexico" now is Coonawarra Shogun who we jointly owned with Westwood Alpacas. The drought managed to take a rest just in time to turn the 2007 Hawkesbury Ag Show into a mud bath. Fortunately, due to The Shed, proceedings were able to take place with a minimum of fuss and Richard Watson was able to judge some 180 odd exhibits. Iceman's result was particularly pleasing as he was in a class of nine an ran a close 2nd to the eventual Champion Adult Male. We were also happy with the 2nd for Marconi, given that he was in a class with a SLF boy who was later awarded Reserve Champion Senior Male. The annual excursion to the Royal Easter Show is over for another year. With entries from all over Australia the competition was fierce. We were therefore delighted to walk away with 3 minor placings. 3rd Junior Male - Grey/Roan (Strathclyde Campbell [MG]) Shown on behalf of one of our agistees. And so our show season begins. Castle Hill was our first venture for the year, and we're very happy with the results. Congratulations also to one of our agistees, Strathclyde Alpacas, who won a First with Strathclyde Campbell in the Junior Male Grey/Roan class. Very happy with the results of the weekend at The National. Venus sold at the auction for $12,500 + gst to Judy Taylor of Glenhaven Alpacas. It's nice to know she's gone to a good home and we look forward seeing her offspring in the ring. Gunnamatta Marconi managed a 2nd in his class behind a boy he had beaten when he won the Best Adult Male ribbon at the recent Charles Ledger Grey Show. Gunnamatta Sheldon got a 3rd against some pretty useful opposition in the White Senior Male division. Things have been fairly hectic since our last news item. The time has been well spent with a few days of shearing, a visit interstate to do some ET work with Gunnamatta Marconi and, last but not least, the final Spring Shows for 2006. Just received the news that Gunnamatta Venus has been accepted for the National Sale to be held following the National Show in Canberra. Venus is a pretty Dark Grey maiden sired by Merungle Hot Chilli. Her dam, Gunnamatta Jewel (DB), is a broad ribbon winning daughter of Purrumbete D'Artagnan (LF). Venus has been a regular member of our show team and has a number of blue ribbons to her credit. At the 2006 Sydney RES she placed 3rd behind two girls who were later sold to overseas breeders. As the only grey on offer it is hoped that Venus will be of interest to a discerning buyer. Our trip up to Wyong proved to be a great success, despite the fact that a couple of the team managed to take an evening shower the night before! Appearing in some rather large classes, our entries managed to catch the eye of Judge Ron Reid. Mudgee again turned on the weather for us - something like 40mm of rain over the two days of the Field Days. Despite this our Show Team did us proud with one White, two Red, two Blue and two Reserve Champion ribbons shared amongst our 5 entries. Our grey girl, Gunnamatta Wild Iris was snapped-up by The Moshers of Merrima Alpacas, Rylstone. It's great to know that she's going to a good home and will be well looked after. Methinks the Moshers must like what we're doing - this is the 3rd time they've bought our offerings at the H-BM Fiesta & Auction. In addition to this, they also placed the winning bid for Gunnamatta Marconi in the Silent Auction. Just returned from the Sydney Royal Easter Show. Very happy with the results, given that there was some pretty stiff opposition and large classes. Gunnamatta Venus picked up a 3rd in the Junior Grey/Roan female class and our only other entry, Gunnamatta Chanel, was awarded a 4th in the Intermediate White female class. Just received notification that Gunnamatta Wild Iris has been accepted as Lot 6 at the 2006 Elite Auction, part of the Hawkesbury-Blue Mountains Alpaca Fiesta. Iris is a pretty little girl and is the third grey of ours to be selected in this prestigious auction. Our previous greys were in 1999 (Gunnamatta Highland Rose) and 2003 (Gunnamatta Gypsy Rose). In view of the distances involved and the need to be away from the farm and Galston for about a week, we've chosen not to contest the National Show this year - maybe try in Canberra in 2006. Rhiannon is a superfine white, show quality granddaughter of the legendary Purrumbete Highlander. Her sire is championship winning Jilliby Lodge Celtic Mist (SW) and her dam Somerset Peruvian Rhapsody (SW). Rhiannon is a stunning young girl with a sweet nature, correct, compact frame and a lovely head. She will be approaching mating age by the time of the Auction. With her excellent first fleece statistics (17.28 micron, 3.66 SD, 21.39% CV, 16.85 SF) and quality Solid White genetics on both sides of her pedigree, Rhiannon would be an ideal addition for those looking to improve the quality of their herds. The Kerri-Anne day on Channel 9 went off without a hitch. All very exciting, rubbing shoulders with the stars. Glenrowan was on his best behaviour and was the star of the show. Hopefully we will be able to figure out a way to get the video clip loaded onto the website, just in case, like the rest of the world, you were working when the segment went to air. Delighted to announce that our grey, Gunnamatta Glenrowan, today took out not only his class, but also "Best Grey in Show" at the prestigious Charles Ledger in Liverpool. Exciting news - Gunnamatta has been invited to take a mob of alpacas to visit Channel 9 & Kerri-Anne on Tuesday 28th September. The segment goes out live, so hopefully the wee beasties don't disgrace themselves! Took the day off on Sunday 12th September and wandered down to Castle Hill with the dogs to the annual "Paws in the Park". A truly great initiative of the council and a great opportunity to "socialise" for both Jasmine & Mitchell. The day was made all the more successful when Jasmine, our liver-coloured English Pointer, won the "Most Wagging Tail" event against some stiff opposition. Slowly but surely knocking "Oakleigh" into shape - quite a learning curve for a couple of city slickers. Most of the time has been spent creating paddocks ranging in size for about an acre up to about twenty or so. Compared to real graziers, these are nothing more than house paddocks, but it's great to see alpacas doing what they do best - wandering around, sampling whatever goodies the can garner from the drought affected native pasture. The house still remains a work in progress and to date hasn't made it onto the front page of our "To Do" list. Guess you just can't rush these things! From a marketing perspective, things are ticking along more or less to plan. Our latest sale involved an interstate move down/across to the land of Salvation Jane. We've also made our first tentative ventures into providing wethers a sheep protectors. So far so good. The reports are that the boys are doing their jobs and, fingers crossed, have managed to persuade local foxes that it isn't worth the agro. Not much further to add as we prepare for a double dose of shearing - visitors willing to get spat-on are most welcome. Wear a green shirt!